Here's Edward and I looking like we don't know each other on 'that' Instagram sofa. I thought we were going to pretend that we were fighting over the cushion. I was wrong. 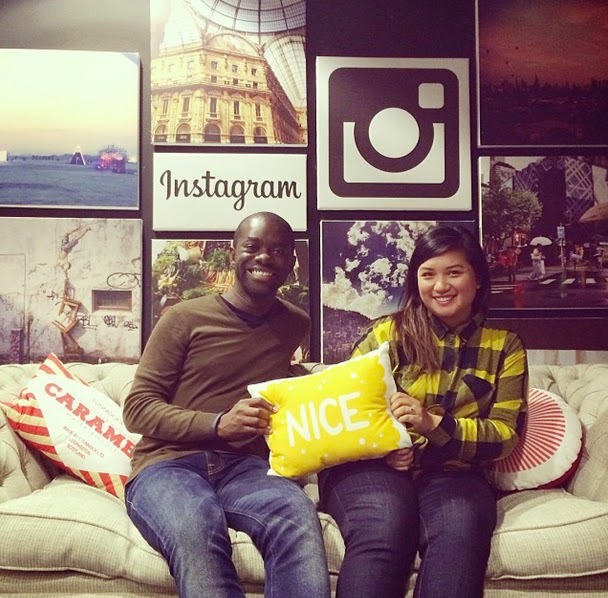 Whilst we are home for Christmas, Edward and I popped in to Instagram Europe HQ and met with the lovely Community Manager - Hannah who kindly took this photo of us. Prior to moving to Hong Kong, I didn't use Instagram a lot. Then it all changed and I got to know and meet other Instagrammers from the Hong Kong community. Coming back home to London, I was excited to meet IGers (sorry going to have to abbreivate, Instagrammers is such a long word) from the London community. We ended up having a little instameet and exploring the Tate Modern and Bankside and I got to meet a whole host of talented 'grammers - @missunderground, @danrubin, @tschang @zobolondon @mattpike @ecolephoto @Rich__ @hellopoe @chaiwalla @mrwhisper @evanjamesatwood, and so many more that I can't remember them all to list them. UPDATE: Oh, I also just wanted to mention a couple of other 'grammers I met on a different photowalk - @h_cato and @imaginationdetonation. You should look up all of the people I mentioned. Not only are they super talented, they were all super nice too. Instagram fwends!